Despite the fact that they are considered by most quidditch analysts to be one of the top teams in the country, few people outside of the Florida Quidditch Conference have actually seen No. 2 University of Miami play since last year’s World Cup. So when they announced their plans to travel to Los Angeles to compete in the Hollywood Bowl, players and analysts across the country were excited to see how the best of the FQC would stack up against the best of the West – 2011 Western Cup champions No. 8 University of Southern California and No. 4 University of California, Los Angeles. 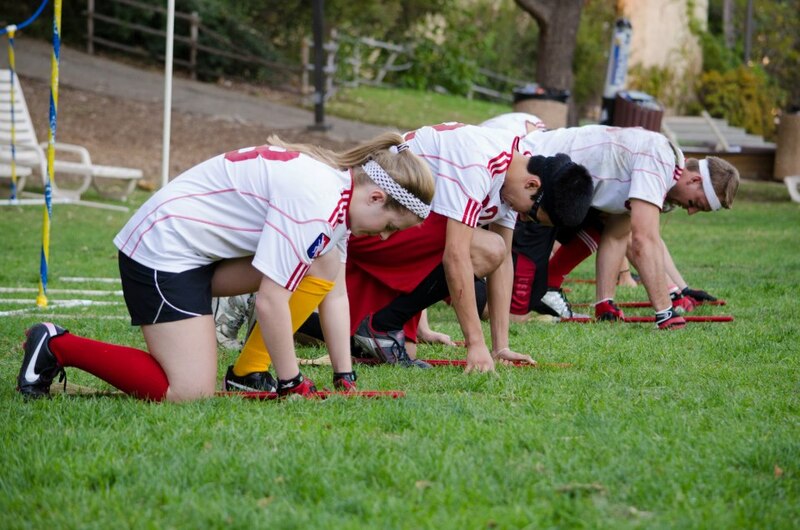 The mood of the Hollywood Bowl was occasionally tense, as some games (USC vs. UCLA and The Lost Boys Quidditch Club vs. The Hollywood Harpies) featured cross-town rivals facing off for the first time this season, and the Western teams went into their games with Miami not really knowing what to expect. By the end of the day, USC came out on top, going 6-0 with several amazing come-from-behind snitch victories. 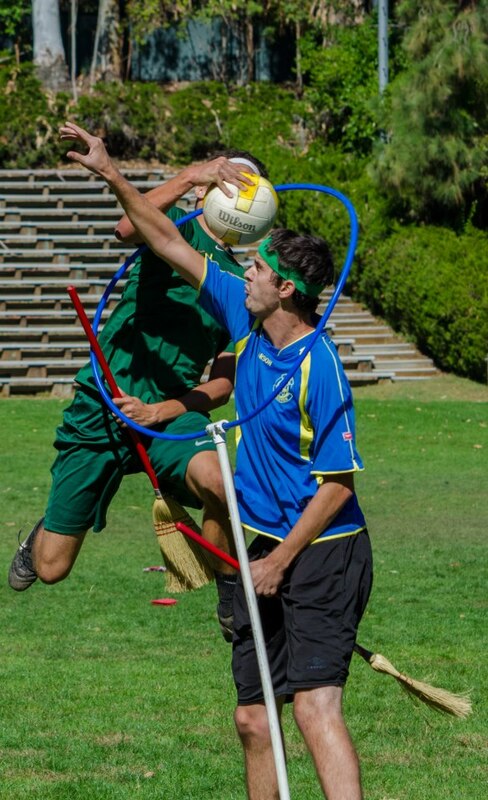 This game was perhaps the most anticipated of the day, as both UCLA and Miami are often considered by quidditch analysts to be two of the top teams in the country. And both teams lived up to their reputations. The match was fast and physical, and each goal was hard fought. The score went back and forth between the two powerhouses, and it became clear within the first few minutes that the game would likely end in a snitch catch. 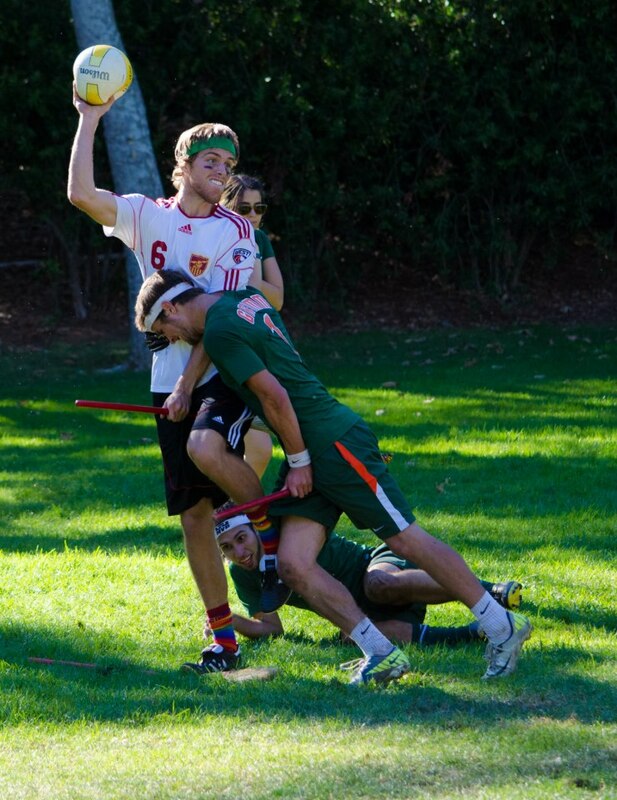 Miami’s seeker David Moyer snuck up on the snitch from behind when Miami was down by 10 for a 110-90 victory. Miami’s fast and strategic offense showed a weakness for the first time in this match, as their chaser line had difficulty outmaneuvering some of USC’s sturdily built and hard-hitting defenders like August Luhrs, David Demarest, and newcomer Remy Conatser. “Come on, we want this more!” was heard several times from Miami’s sidelines as they tried to stay focused despite a few fouls and cards on both sides. The FQC champs stayed in the game until the end, when they fell behind by 40 points and fast but slender-framed Moyer was forced to attempt to keep Conatser, USC’s new go-to seeker substitute for on-pitch action, away from the snitch. Despite Miami’s best efforts, USC was able to grab the snitch, taking the game 150-80. The rivalry between USC and UCLA is one of the best in the league, and both teams had a lot to prove in this game; the last time the two faced off was in the Western Cup finals, where USC, despite being down in goal points nearly the whole game, caught the snitch and took the Cup title.Their familiarity with each other kept any particular player from being able to take over on offense – the major threats were constantly matched up with players of equal strength or speed, and no individual was able to get away with scoring more than two goals. UCLA was up by 10 when USC seeker Jack Cannice suddenly showed up, snitch tail in hand, winning the game for USC 100-80. The first match between USC and Miami was the most physical and captivating game of the day prior to the finals, and spectators seemed both nervous and excited to see them go at it again in the finals. The sidelines on both sides were extremely loud as both teams tried to communicate strategies to their players. “PUSH!” seemingly everyone screamed whenever a new player got the ball, as beaters on both teams seemed to occupy each other pretty well and chasers had to take advantage of any bludgerless moments immediately, without dwelling on the difficulty of plowing through their opponents’ defensive chaser line. A red card for Conatser put the pressure on USC, and even USC coach Mitch Cavender stepped onto the pitch to help his team stay in the game. At one point, Miami led by 40, and USC’s fate seemed all but sealed. But a few quick goals at the end of the game (potentially a result of Miami’s Sean Pagoada beating instead of chasing, where he usually acts as Miami’s first line of defense by putting immediate and strong pressure on the first opposing ball-carrier after a goal) helped USC get back into range, just in time for David Demarest, later named the tournament’s MVP, to catch the snitch and gave USC a 100-80 win and the Hollywood Bowl first place trophy. Overall, USC proved they should be right up with UCLA in analyst rankings, and while Miami didn’t take home the title, the fact that they traveled all that way without several of their starters and still held their own against the best of the West proved they live up to the hype and should definitely be feared next April.